This November, in an effort to increase tax revenue, California will hold a referendum on whether or not to legalise the cultivation and use of marijuana. If passed, the change in law would be devastating to the Canadian economy, halting the flow of billions of dollars from the US into Canada and eventually forcing hundreds of thousands into unemployment. Over the past 20 years, Canada has developed a substantial and highly profitable marijuana industry that is almost completely dependent on the US market. Between 60 and 90% of the marijuana produced domestically is exported to the US via cross-border smuggling operations. It's exactly like the alcohol prohibition of the 1920s, only far more sophisticated and more profitable. The establishment of a legal industry based in the US would likely cripple these exports overnight. Due to its contraband nature, it's difficult to determine exactly how much marijuana contributes to the Canadian economy, but a number of agencies and economists have estimated that it is in the range of $20bn per year (£12.5bn), making it Canada's single largest agricultural product. The bulk of production is based in British Columbia, where it employs a labour force of 250,000, roughly one in 14 adults. Although strict financial controls are often credited as the source of Canada's economic resilience, it's worth pointing out that marijuana production often insulates communities from larger economic phenomenon. The media yesterday having asked Day to justify that kind of spending while the federal government is claiming to be tackling the deficit, one might have expected Day simply to answer that the prisons were to cope with the effects of the government's Truth in Sentencing Act. Parliamentary Budget officer Kevin Page has already estimated that the cost of implementing that Act alone will be in that range, and the Act passed into law months ago. Yet, with his expression of the government's concern over "unreported crimes" Day implicitly foreshadowed an additional source of pressure on prison resources. Most reasonable people no doubt share Liberal MP Mark Holland's view that "unreported crimes" cannot be the reason for building prisons, because unreported crimes are crimes for which nobody is charged or imprisoned. However, that assumption overlooks a few things. The number one reason for not reporting a crime is the belief that the crime in question is not one meriting police involvement or criminal penalties. Millions of Canadians actively cultivate, sell, and possess cannabis despite the threat of fines and imprisonment. Polls in recent years repeatedly indicate that the majority of Canadians want cannabis legalized even for recreational use. And as any fairly social adult will probably have witnessed, police are rarely called to arrest someone who is cultivating, selling, or possessing cannabis. There is, in point of fact, mass civil disobedience, and a benevolent conspiracy of silence, with respect to cannabis offences in Canada. For this reason, cannabis offenses are arguably one of the most frequently occurring - if not the most frequently occurring - "unreported crimes" in Canada. Day is not necessarily making the absurd suggestion that those whose crimes are not reported will be imprisoned. He is saying that those who are charged with committing a cannabis offence - a widely "unreported crime" - will soon be sent to prison in much greater numbers. The actual purpose of the government's prison expansion plans is to accommodate the anticipated impact of the Conservative government's "National Anti-drug Strategy", when one of its key components - Bill S-10 - passes into law. As one source painfully acquainted with the effect of the Harper government's Americanesque drug war agenda explains, the number of sexual assaults, homocides, and other violent offences is fairly constant, year after year, as is the number of people convicted of such offenses. Indeed, as the population ages, the number of such crimes will decrease. Even if incarceration durations for such crimes were doubled, that would hardly put a dent in the prison population. Billions of dollars in additional prison funding is not needed for those sorts of offences, but billions in additional funding will be needed to build prisons for the anticipated thousands of non-violent cannabis (and, to a lesser extent, other drug) offenders who Bill S-10 will soon subject to mandatory imprisonment. To understand what is at stake politically for the Conservatives, a bit of history must be kept in mind. In late 2006, the Harper government attempted to fulfill an election pledge to repeal the recognition of gay marriages. A late 2006 motion to revisit the issue of gay marriage failed, leaving unsatisfied social Conservative yearnings for a war against Canada's changing culture. However, gay marriage was only one of two major cultural changes in Canada that steamed social conservatives in recent years. The other was Canada's changing laws on cannabis. A 2000 decision in Ontario's Court of Appeal made cannabis a legal medicine (it remains so to this day, though federal and provincial governments have failed to provide adequate safeguards for physicians - who face concerns of losing their licenses to practice should they prescribe cannabis - and to ensure that patients have the cannabis they are prescribed). In 2002, a Senate report recommended that recreational cannabis be legalized, and a House of Commons report released shortly thereafter recommended that imprisonment be replaced with a system of stiffer fines (a recommendation known as "decriminalization"). The Canadian Alliance, then led by Stephen Harper, condemned those proposals on the ground that they would further inflame Canada-US relations at a time when Canada's Liberal government had refused Canadian involvement in America's war against Iraq (Harper's Alliance opposition had indicated that it wanted Canada to join in the war against Iraq). Elections in 2004 and 2006 scuttled the Liberal government's decriminalization plans, and Harper's Conservatives formed a government with the smallest minority in Canada's history. By October of 2007, the legalization of cannabis was supported by 51% of Canadians (a number that crept up to 53% a year later). However, the Conservative government having let down its social conservative base with respect to gay marriage, it announced it would be launching a "National Anti-drug Strategy". "In the next few days, we're going to be back in the business of an anti-drug strategy," Clement told The Canadian Press. "In that sense, the party's over." Clement, together with none other than Stockwell Day (who was then Public Safety Minister), attended Prime Minister Harper's October 4, 2007 press conference, wherein his $63M anti-drug strategy was announced. Given that the anti-drug strategy was a significant bone thrown to the Conservative party's religious, social conservative constituency, rather than to the relatively secular majority of Canadians, it should not surprise the reader that the press conference was held at a Salvation Army headquarters (in Winnipeg). What we are up against, in trying to resolve this problem - what the police are up against, what the people who deal in treatment and prevention are up against - is a culture that, since the 1960s has, at the minimum not encouraged drug use and often romanticized it; romanticized it, or made it cool; made it acceptable. And look, as a father, I don't say all these things blamelessly. My son is listening to my Beatles records and asking me what all these lyrics mean. And, you know, it's just there, it's just out there, I love these records, I'm not putting them away. But, that said, the reality is that there has been a culture that has not fought drug use! And that's what we're all up against! No easy solutions to that but we have seen, in the case of tobacco, a shift in the culture, in a way that has rendered tobacco use less and less socially or culturally acceptable. I think we need to do the same thing - I think we need to do it much more quickly and much more critically - in the area of narcotics. On November 20, 2007, the Harper government introduced Bill C-26. Titled An Act to amend the Controlled Drugs and Substances Act and to make consequential amendments to other Acts, the Bill proposed doubling the maximum term of imprisonment for cannabis-related crimes: from 7 years, to 14 years. It also proposed a minimum sentence of 6 months imprisonment for the cultivation of 1 to 200 cannabis plants where the purpose of growing the cannabis was to sell it. Higher mandatory minimums were proposed for greater numbers of plants, or for other aggravating factors. The bill passed second reading on April 18, 2008, but the dissolution of Parliament for the 2008 election killed the bill. Bill C-26 was re-introduced as bill C-15 and passed third reading on June 8, 2009. It was then sent to the Senate. They've taken the mandatory penalty out, and so we're very unhappy with this...we take this very seriously, and we believe that people should have a mandatory jail time for people who are in the business, in the grow-op business. What about the notion that this is going to be very costly. I mean, the government said on one hand 'we don't want to have a huge deficit, we want to control spending costs'. On the other hand, building more prisons and taking more people in is an expensive cost. How do you mitigate that? I can tell you that we wanna get the message out to people under the National Anti-Drug Strategy. Many people will be seeing advertisements running right now across this country, discouraging people, educating them about the problems of taking drugs in this country. We want to help individuals to get them off of drugs in this country and not to experiment with them. In other words: imposing mandatory minimums will cause people to stop breaking the law, so fewer people will get imprisoned and the costs of prisons and incarceration will thereby be mitigated. With so many millions of Canadians growing, selling, and possessing marijuana despite its criminality, we are supposed to believe that what is perhaps the most "unreported crime" of all in Canada - cannabis "crime" - will suddenly tail off so much as to offset the effect of mandatory sentences of imprisonment imposed upon people who normally would not be sentenced to any jail time. The Minister's credulity on this issue is almost unbelievable. The key words in that section are "during the session". The effect of "prorogation" - wherein the Prime Minister advises the Governor General to end a Parliamentary session - is that all bills that have not received royal assent before prorogation die. On December 30th, 2009, just 16 days following third reading of bill C-15 in the Senate, Parliament was prorogued, killing the bill before it received Royal Assent. Was the prorogation motivated, at least in part, by government's desire to have C-15 passed into law without the Senate's amendments? In other words: just how much priority is the Harper government placing upon its war on Canada's cannabis culture? Consider three things. First, it should be noted that the Senate had debated C-15 far more than any other bill in the Senate: 62 hours, 3 minutes. At the time of prorogation, only 2 other bills had passed the stage of third reading in the Senate: C-6 (regulating dangerous consumer products) had been debated for 37 hours, 42 minutes; and Bill S-8 (which implemented a tax-evasion treaty with South American countries) had been debated for 1 hour, 49 minutes. Second, soon after proroguing Parliament, Stephen Harper appointed five more Conservative Senators. This was enough to give Bill C-15 a good chance of passing third reading in the Senate without amendments. Third, before the new session of Parliament began, Justice Minister Rob Nicholson was asked whether any of his crime bills would be re-introduced. He was not certain about any except one: Bill C-15, he said, was certain to be re-introduced. Indeed, Bill C-15 has since been re-introduced in the Senate as Bill S-10, in its unamended form. Having already been debated on three days, Bill S-10 has yet to pass second reading in the Senate. With a greater number of Conservatives serving in the upper chamber, it now seems much more likely that mandatory minimum sentences for the tiny fraction of cannabis-using Canadians caught committing what are usually "unreported offenses" will soon be a reality. In addition to imposing longer periods of incarceration, the change essentially eliminates some of the pesky procedural hoops - also known as "due process in a free and democratic society" - through which police have to jump in order to arrest people for cannabis offenses. Clearly, cannabis, and the Conservatives' war on Canadian culture, continues to be top-of-mind for the Conservative government. I submit that the evidence strongly supports the conclusion that Harper's anti-cannabis culture war is actually the centrepiece of his entire government agenda for that large percentage of Conservative supporters who see cannabis users - and homosexuals - as plagues on Canadian culture. The money be damned: this back-bone of the Conservative Party sees Canada's popular embrace of legalization as a threat to the 1950's style, clean-livin' Canada of its spare-the-rod-spoil-the-child youth. The so-cons see cannabis cultivators, sellers, and possessors as snakes from whom Godly government must deliver them. If they cannot persuade Canadians to embrace their prohibitionist views, they will continue to demand of the Conservative Party that it lock-up cannabis-tolerant "liberals", and leave them to rot. I suspect strongly, and angrily, that we are going to need those prisons. However, I am reasonably sure that the majority of Canadians - given an alternative to seeing their children criminalized, marginalized, imprisoned, and otherwise having their lives destroyed so that religious conservatives will keep voting Conservative - would prefer an intervening election. UPDATE: Well, well, well. Will the "coincidences" never cease? It was reported on Facebook that, at about 5:25 PM today (approximately 2 hours after the above blog was posted to my own site, http://blog.paulmckeever.ca), police again raided Toronto's C.A.L.M. cannabis compassion club. Imagine that: an evening news program in which there will be "proof" that the Harper government "needed" to make the regulatory changes announced earlier today. Makes me wonder if I should charge for soothsaying. As though we needed to be told (again), but keeping marijuana illegal is busy funding gangs and bad guys. Can we legalize pot already? Geez. David Boaz over at [email protected] comments on a group of marijuana growers in California that fear legalization will mean a drop in prices and a corresponding drop in their own income. This seems to reinforce the argument that the one thing that criminal organizations fear the most is legalization (though to be fair these old hippies are pretty benign criminals). It just goes to show you that economic interests aren’t always what you would assume them to be. Poll question: Should Marc Emery be handed over to the U.S.? Yesterday, we covered the story of three MPs (Conservative, Liberal and NDP) who presented petitions to the House on Monday in favour of keeping Marc Emery in Canada. Emery, libertarian publisher and cannabis activist, is facing a five-year stint in a U.S. federal penitentiary for selling viable marijuana seeds to Americans. A Canadian court handed down a $200 fine to a marijuana seed seller convicted of selling millions of marijuana seeds. The CBC asked their readers this "Question of the Day": "Should Marc Emery be handed over to the U.S.?" The results were fairly surprising. Fully 92 per cent of respondents (1680 votes) said "No," with 7 per cent (132) answering "Yes," and less than 1 per cent (16 votes) saying "Not sure." Paul McKeever, leader of the Freedom Party of Ontario, lawyer, and long-time Objectivist, has released the first part of a two-part documentary about Marc Emery's life at midnight today. Just after midnight tonight, Ontario lawyer Paul McKeever will release Part 1 of "The Principle of Pot", his new two-part documentary about the nature and motives of Marc Emery, the media-dubbed Prince of Pot. Part 1 runs 1 hour and 39 minutes. Part 2 will be released at a later date. The launch is timed to precede a decision by Canada's federal justice minister, Rob Nicholson, about whether or not to approve the extradition of Emery to the United States, where he faces years of imprisonment for having sold cannabis seeds, in Vancouver, Canada, via mail order. The Minister's decision is expected within the next 81 days. Emery's opponents, and the U.S. authorities who demanded his arrest in Halifax, have attempted to portray Emery as a profit-motivated drug dealer. Part 1 of McKeever's documentary will cover the period up to 1990; a period during which Emery was equally active as an advocate of individual freedom, but whose advocacy of individual freedom did not include campaigns concerning the issue of cannabis prohibition. The first part of this documentary is worth watching. Apart from sharing Emery's early pro-liberty activism with the Freedom Party in London, Ontario, the documentary also presents a sympathetic explanation of Ayn Rand's philosophy of Objectivism, and gives viewers something of a history of the individual liberty movement in Canada. Canadian Tommy Chong, of Cheech and Chong fame, has started to don a Free Marc Emery t-shirt (which you can purchase here) for his television appearances. Marc Emery, dubbed the "Prince of Pot" by the Seattle Times and popularized by CNN, is out on bail, awaiting his penultimate extradition to the United States to face a five-year prison term for selling marijuana seeds over the internet. Many Canadians and Americans are outraged by the efforts of the U.S. Drug Enforcement Agency to extradite Emery. Similarly, many are surprised and dismayed at the failure of the Canadian political establishment to speak out in defense of a fellow Canadian. New Marc Emery documentary: "The P.O.P." Paul McKeever, lawyer and leader of the Freedom Party of Ontario, has put together a documentary about the political activities of Marc Emery. The documentary will be released very soon, around the same time as the book, "Seeds of Liberty: The Marc Emery story." Federal Government Sponsors Drug "Research"
I love science, I am a fan of it; good science that is. The Federal Government is funding research into the relation between smoking marijuana and mental illness. "Science has shown that cannabis may actually trigger the onset of psychosis and may also intensify the symptoms for those who already have a psychotic illness," (Winnipeg Conservative MP Joy) Smith (Kildonan-St. Paul) said in announcing a grant of more than $550,000 to the Schizophrenia Society of Canada. The grant of $559,370 is the largest Health Canada has ever provided to the society, he said. The money is part of Ottawa's $30-million national anti-drug strategy, announced in 2007. Do you think the study will be bias at all? Marc Emery, the Prince of Pot, will be turning himself in to U.S. authorities in September to serve a 5 year sentence for various charges related to his marijuana activism. That activism consisted of selling marijuana seeds to people through his mail order business from his downtown Vancouver store front. He was interviewed about his upcoming incarceration, civil disobedience, marijuana laws, and other legalization subjects on this past Saturday's edition of liberty talk show Free Talk Live. The Federal Government has been growing marijuana in an old mine in Flin Flon Manitoba for 9 years for the 300 people that receive the plant from them for medical purposes. The company that has been contracted to grow the pot for Health Canada, Prairie Plant Systems, says that they ceased operation June 30th because they couldn't secure long-term access to the mine since it's owner, Hudson Bay Mining and Smelting, is closing it down in 2012. The government's marijuana program licenses certified medical users to grow their own pot, to have someone grow it for them or to buy it straight from Health Canada. More than 1,400 Canadians are authorized to possess marijuana for medical purposes. I find it strange that Health Canada was tasked to grow the pot for medical use. Does Health Canada manufacture Demoral? Morphine? Tylenol 3 or any other pain killers available by perscription? Nope. The drug manufacturers do that, and they do a better job of it. If medical marijuana alone was opened up to drug companies you would have some level of competition at least that may improve the quality of the product; government pot doesn't have a great reputation as far as quality is concerned. The government says it's okay for them to have a grow op, but anyone else that does so is raided, arrested and possibly shot at. It's hypocritical. Legalize it, all of it. Let me make very clear that I do not advocate most drug use; I think that using some drugs is generally bad. I have never used “recreational” drugs in my life, ever. I think our society would be better off if many drugs didn’t exist; but they do, and there is a demand for them, so they continue to be manufactured and sold. Prohibiting and controlling drugs does not stop some people from having the desire for them, that is unlikely to go away; as long as these desires exists there will be a demand and market for them, and some folks will be willing to meet that demand, whether it's legal or not. Do you believe that you own yourself? If you truly own yourself, then you are free to keep yourself as fit or as fat as you want. If you truly own yourself, then you are free to put into your body what you want, be it apples or marijuana. The principle here is self-ownership; you own and are in charge of yourself. Because of this, you are responsible for yourself (provided that you have the mental capacity to be) and are free to make good or bad choices, provided that those choices don’t violate the liberties of other people. Using harmful drugs is generally a bad choice in my opinion, but it is one that you have the right to make as it harms yourself directly, just like eating too much fatty food or listening to your Ipod at full volume all day. Obviously, there are social consequences of using drugs and the possibility of becoming addicted; you may be ostracized from friends and relatives, if you have people financially depended on you they may be negatively affected. There will be indirect effects on people from your actions no matter what you do, these cannot necessarily be controlled or measured, that’s why the focus is on the actions you can control; your own. It’s harder for the general public to hear the message of “legalize ALL drugs”, it’s not something that is often heard, therefore I will focus on the legalization of marijuana, though the arguments for it’s legalization will apply to other drugs like heroin, cocaine, meth etc. Though is has been shown that there are medicinal benefits to marijuana, the reason for it’s legalization is still based on the principle of self-ownership, but I will look at some of the common arguments for and against it, while still holding the self-ownership principle as the main reason for why it should be legalized. In 2000 over 30,000 Canadians were charged with simple possession of marijuana, according to the Senate Committee on Illegal Drugs. Current laws are enforced unevenly across the country. Most of those convicted of possession of marijuana do not go to jail, but do receive a criminal record. Think of the waste that goes into policing drug users. 30,000 people in Canada charged ever year. That means that every one of those people were dealt with by police, then entered into the system, paid fines, court dates, etc. The amount of bureaucracy needed to deal with this is staggering. Now, all of those people have criminal records. They will have a harder time getting a job, crossing borders, finding suitable housing, etc., all because they choose to put something into their body. That is not good for them or good for the rest of society as they may end up drawing on welfare or other socialized programs becasue of the lack of opportunities a criminal record may bring them. So the point comes up, then why do them? As a non-marijuana user I cannot answer that, other to say that people have been suing this substance for many years, and it's illegal nature has not dettered many of them or halted the drug trade. To some folks the risk is worth it. Every April 20 at the Legislature here in Winnipeg, you will find thousands of people lighting a blunt in open protest of the illegality of marijuana, yet there aren’t swarms of police coming down to break it up. Yet they will spend time going after people in their homes, on the street, etc. Why this inconsistency? Even the police realize that possessing marijuana is not a serious enough offense to warrant shutting down this peaceful protest. This seems like an inconsistent, hypocritical position. The problem isn’t the police, it is the law, and the beaurocrats that make the law. Speaking of hypocritical positions, even though growing, possessing and distributing marijuana is illegal, the Canadian government continues to do it to this day. Government pot is grown in an abandoned mine in Flin Flon, Manitoba, and used for medicinal marijuana. The use of marijuana for medicinal purposes has been well established, and Health Canada recognizes and approves its use. Health Canada grants access to marihuana for medical use to those who are suffering from grave and debilitating illnesses. Yet, you aren’t allowed to grow your own medicine if you so choose, the government has to do it for you and give you a piece of paper that allows you to have it. Why is the goverment in the medicine business? Is there Province of Manitoba brand ibuprophen? No one else is allowed to provide this approved medicine, only the government. This is another government monopoly like Manitoba Lotteries and MPI, making the bearuocracy larger, demanding tax money to grow pot. I wonder how someone who is against the legalization of marjiana would feel knowing that they are paying to grow and distribute it. What would happen if pot was legalized? We can look at history to find out. In the early 1900’s alcohol manufacturing, distribution and possession was made illegal all over North America. When something is outlawed, it creates a black market for that product or service. When something is in the black market it inherently becomes more dangerous because it needs to be under the radar of law enforcement. It becomes the product of gangs and organized crime, and prices get very high, and violent crime surrounds it. This is what happened with alcohol prohibition; people didn’t stop drinking, they just had to do it underground. Once alcohol prohibition ended, so did the violence and crime surrounding it’s manufacture and distribution. Do we currently see turf wars or gang crime with alcohol distribution? No, it went away when prohibition went away. The same thing would happen if the prohibition against marijuana was ended. Let’s look at this realistically. If marijuana wasn’t prohibited, how would people get it? Likely the same way people get alcohol and tobacco; large companies will grow and sell it and you can buy it at the corner store. Plus, you will have companies selling “home growing kits” so you can grow your own. You won’t need to buy it on the street under threat of arrest and the prices would be lower because there will be a large, safe supply and legal ways of obtaining it. If people could choose between a drug store or a thug on the street, where would they be likely to go to buy marijuana? If murder wasn’t on the books as being illegal, would people murder each other? Laws don’t dictate behavior, marijuana is illegal right now yet people still use it, the law doesn’t stop that. If it was legalized, people who were going to do it will still do it, and people who weren’t going to do it won’t. There is a taboo in doing something illegal, and once that taboo is gone, then a small part of the thrill is gone. In September 2007, the Canadian Centre on Substance Abuse reported that marijuana use in teens have gone up (opens PDF). Would arresting 50% of Canadian teens do them any good? How would that help them in life? It won't stop them from using the drug, just put them into the legal system and make it harder to move forward with a productive life. Let’s look at a place where pot is less restricted, Amsterdam and some of Australia. The usage of marijuana in those areas is actually lower than that of the U.S. This report shows that the prohibition of marijuana in the United States has not curtailed adolescent marijuana use. To say that legalizing marijuana would lead to an increase in use is not what the evidence shows. In March 2009,the Cato Institute put out a report about the success of drug decriminalization in Portugal. You can see the policy forum and presentation of this report at the Cato Institute website. Also, to call marijuana a “gateway” drug is misleading. Using marijuana does not mean that you will then use, cocaine, heroin or other harmful drugs. It is most of then the first one that people will use because it is the most common and least expensive. Calling marijuana a gateway drug is like calling beer a gateway drink that means you will start misusing alcohol and more potent drinks, it is not necessarily true. Most people first encounter beer, it is less expensive than harder drinks so it is naturally what would be encountered first. As for sending “conflicting messages” to young people, I say, let them make up their own mind. The message we can send is that some things are good for you, some things are bad, you choose which you’d like to do. In fact, I wouldn’t call marijuana “bad”, no more than I would call having a beer “bad”. I’m going to teach my children to choose for themselves, no conflicting message there. The argument that marijuana is harmful doesn’t stand up either. Yes, it can cause some harm to the body, but if we were to outlaw things that were harmful then perhaps we should be outlawing salt, butter, etc. By this reasoning, anything harmful to an individual should be prohibited. Well, then here are a few other things that should be banned then. If we truly own ourselves, then we are the ones that choose what we can and can’t put into our bodies. If we choose to harm ourselves with drugs, or salt, or getting fat, then that is also our choice. Please keep comments on topic and cordial. Insults and ad hominems may result in deleted posts. "Well, I think it's not time for (legalization), but I think it's time for a debate," Schwarzenegger said. "I think all of those ideas of creating extra revenues, I'm always for an open debate on it. And I think we ought to study very carefully what other countries are doing that have legalized marijuana and other drugs, what effect did it have on those countries?" Our judgement, based on review of the research literature, is that at present the primary harms of marijuana use (including those borne by non-users) come from criminalization: expensive and intrusive enforcement, inequality, shock to the conscience from disproportionate sentence and a substantial (though generally non-violent) black market. If drug policies are a potent influence on user behavior, there should not be such strong similarities across such different drug control regimes. Our findings do not support claims that criminalization reduces cannabis use and that decriminalization increases cannabis use. Moreover, Dutch decriminalization does not appear to be associated with greater use of other illicit drugs relative to drug use in San Francisco, nor does criminalization in San Francisco appear to be associated with less use of other illicit drugs relative to their use in Amsterdam. Indeed, to judge from the lifetime prevalence of other illicit drug use, the reverse may be the case. If only we could get our politicians talking seriously about legalizing marijuana. Besides issues of freedom and liberty, there are many economic reasons why Canada should get serious about reforming our outdated drug laws. If Canada were to adopt the illicit drug policies of the Netherlands, the costs associated with prohibition would be marginalized in the areas of policing, judicial processes, and health services. If the sale of marijuana were to be legalized in Canada, the respective costs associated with policing would decrease due to the fact that Canadian society would not ensue the corresponding costs of arresting people for the consumption and distribution of the drug. Likewise, the judicial system would not incur the costs of prosecuting and incarcerating individuals for marijuana related transgressions. Furthermore, the corresponding tax revenue that would be accumulated through the legalized sale of marijuana could be used to enhance education and rehabilitation programs that would effectively marginalize the negative externalities associated with illicit drug use. Update: It's been brought to my attention that a new poll shows that 52% of Americans support legalizing marijuana. While this is promising, there has also been some criticism of how the poll was conducted. More from Reason Magazine. As federal Justice Minister Rob Nicholson puts it, coffee is "the currency that is used to bring other more serious drugs into the country." Oops . . . did I say coffee? How embarrassing. Of course, it's quite ridiculous to suggest that we would criminalize the sale or consumption of coffee. Oh sure, prohibiting the sale of coffee would immediately make it the purview of organized crime, thus making it a "currency" of sorts. No doubt such criminal elements would employ violent tactics in obtaining and protecting supply and territory. You've heard it all before from me, so without further ado here's another good article on the drug war from CNN. h/t: Steve, who says: "Either you have drugs and violence on the streets, or just drugs. Seems like an obvious choice." Cato study: Decriminalization of drugs in Portugal an "unambiguous success"
In 2001, Portugal decided to make a dramatic U-turn when it comes to drug policy. Alone in the European Union, Portugal decided to try decriminalization of drugs as a strategy to deal with the negative outcomes of illicit drug use. They did not merely decriminalize marijuana, they decriminalized all drugs. Without exception. Glenn Greenwald has taken a look at the numbers and reports, in a new Cato Institute study, on the outcomes of Portugal's new policy direction. The results, according to him, are positive. And not merely positive, but very positive. Decriminalization in Portugal is working, it is an "unambiguous success," as Greenwald puts it. Greenwald will be at the Cato Institute today to discuss his reports. At 12 p.m. Eastern Time, you can watch his presentation by clicking here. ...Drug policy is being more openly debated than ever before in the U.S. (Time 's Joe Klein just wrote a column advocating marijuana legalization [CNN's Jack Cafferty also recently wrote a piece entitled "The War on Drugs is insane. "]), and the unambiguous success of Portugal's 2001 decriminalization -- which is what enabled the Portuguese Government to address their exploding drug problems in the 1990s and to achieve far better results than virtually every other Western country -- provides a compelling empirical basis for understanding the profound failures of the American approach. Pat Buchanan, writing about "The Drug War's (Other) Afghanistan," by which he means the violence-drenched state of Mexico, asks "Which is the greater evil? Legalized narcotics for America’s young or a failed state of 110 million on our southern border?" Critics are concerned that this move will endanger the public, and California's attorney general, Jerry Brown, has already said that the state plans on appealing the ruling to the Supreme Court. One suggestion that California may take seriously is to ease the war on drugs, especially when it comes to the war on marijuana. By not incarcerating pot smokers, releasing non-violent marijuana-related "criminals," and essentially decriminalizing marijuana, the state would immediately see significant savings. - An excise tax of $1 per half-gram joint of marijuana would raise about $1 billion per year, as much as the current excise tax on cigarettes. - Retail sales on the legal market would range from $3 - $5 billion, generating another $250 - 400 million in sales taxes. - Legalization would save over $156 million in law enforcement costs for arrest, prosecution, trial and imprisonment of marijuana offenders. Intrusive CAMP helicopter surveillance would also be eliminated. - Based on experience with the cigarette tax, total revenues of $1.5 - $2.5 billion might be realized. - Based on experience with the wine industry, the total economic activity generated by legal marijuana could be nearly three times as great as retail sales, around $8 - $13 billion. Amsterdam-style coffeehouses would generate jobs and tourism. If the marijuana industry were just one-third the size of the wine industry, it would generate 50,000 jobs and $1.4 billion in wages, along with additional income and business tax revenues for the state. - Industrial hemp could also become a major business, comparable to the $3.4 billion cotton industry in California. More Western Standard coverage of Phelps and the debate over marijuana here and here. “The president believes that federal resources should not be used to circumvent state laws, and as he continues to appoint senior leadership to fill out the ranks of the federal government, he expects them to review their policies with that in mind," White House spokesman Nick Shapiro said. In the meantime, I merely note that this broken wreck of a man's failure to win any more than a pathetic fourteen Olympic gold medals (so far) is a terrifying warning of the horrific damage that cannabis can do to someone's health—and a powerful reminder of just how sensible the drug laws really are. Destroying society, one gold medal at a time. Jack Hunter, aka The Southern Avenger, my favourite video commentator, has been busy lately. I posted his commentary on the direction the GOP should go in (namely, whether they should pick Bobby Jindal for leader, or Mark Sanford) yesterday. Today, I'm posting his recent explanation of why the war on drugs is an absolutely waste of time, waste of money, and waste of dignity, and freedom. I agree with Hunter on all of those things. The war on drugs is quite possibly the most devastating and, frankly, stupid, bundle of government policies in the U.S. (and Canada). Western Standard columnist and libertarian publisher Marc Emery is in the middle of a three-part series of columns entitled "Creeping Jackboots" (part one, part two) on the effects of drug prohibition on our liberties, our safety, and our wallets. That's worth checking out as well. Today marks the anniversary of the December 5, 1933 repeal of alcohol prohibition in America. While the war on other-drugs stills rages with similar results and consequences, we should celebrate the small victories in drug policy reform. Americans for Safe Access reported this week that the U.S. Supreme Court has refused to review a landmark decision in which California state courts found that its medical marijuana law was not preempted by federal law. The state appellate court decision from November 28, 2007, ruled that "it is not the job of the local police to enforce the federal drug laws." This move by the Supreme Court should mean that the federal government will no longer obstruct marijuana law reform initiatives like those seen in Michigan and Massachusetts in the last U.S. federal election. While alcohol is no longer prohibited, other things still are. Puritanical and paternalistic prohibitionists are always busy looking for ways to restrict our liberties, and to make decisions for adults about how they should live their lives. The most glaring, and disastrous, example of this is the continuing war on drugs in the U.S. and Canada. So vile and outrageous is this war, that it has helped lead to incarceration rates in the U.S. that far surpass those in dictatorships like Communist China (#26), Communist Cuba (#3), or secret police states like the Russian federation (#2). Fully 738 of every 100,000 citizens are locked up in the U.S. (Compare that to the estimated 838 per 100,000 rate during the GULAG of the Soviet Union). With less than five per cent of the world's population, the U.S. has 23 per cent of the world's prison population. 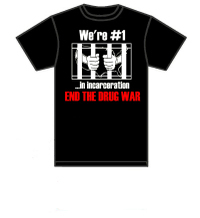 Now you can send a little message by getting yourself a newly-designed "End the Drug War" t-shirt from the good folks at Bureaucrash for US$17.76 (yup, 17.76...). Pete and the gang at Bureaucrash: Put together a t-shirt that can work for Canadians as well, please. We've got a war on drugs too, and we like t-shirts with solid pro-liberty messages as well. Matthew Johnston, publisher of the Western Standard, has made it clear that, at least until the end of February, he's a "single issue non-voter." That single issue is preventing the extradition of our mutual friend, libertarian publisher and Western Standard columnist Marc Emery. I'm happy to be on-side with this single-minded activist pursuit. Over the next several months, Matthew, myself, and the more liberty-minded members of the Western Standard community will be agitating for a political resolution to the threat of extradition being faced by Emery. If there is a positive spin that can be put on this NDP-Bloc-Liberal coalition, it really is the fact that preventing the unjust, shameful, and shocking extradition of Emery is made a little bit more likely. But while we're focusing on Emery's personal travails, Emery isn't sitting idly by and lamenting his condition. He's steeled himself to the possibility of extradition, and he's agreed, as all civilly disobedient peaceful protesters do, to go to the U.S. and face the possibility of life in prison should Canada's government decide to send him south for the "crime" of selling marijuana seeds. Even so, he's also busy writing a great deal about the slow and steady growth of the anti-marijuana industry in Canada, and why the attempt to obliterate that culture is both ominous in itself, and something the rest of us should resist, whether or not we smoke pot, care to, or even like it. In part two of Emery's three-part series entitled "Creeping Jackboots," Emery sheds light on the use of seizure and confiscation laws that are being used more and more often in Canada to impoverish and humiliate a significant number of our fellow Canadians. Civil forfeiture laws were instituted in Canada under pressure from United States drug war fanatics who insisted Canada was a supplier of illegal drugs to the U.S. In the U.S., forfeiture laws frequently pay the salaries of law enforcement, and keep police departments solvent. Couples have committed suicide over losing their homes to forfeiture; others have decided to go out with guns blazing (Rainbow Farm in Michigan). U.S. police have shot people dead in raids aimed solely at seizing homes and property because of marijuana. Seizing the homes and property of the marijuana culture has become a multi-billion dollar industry complete with its own resale catalogues and auction network. Civil forfeiture creates a criminal mentality in police. There are cases where police who need power tools or a TV have seized them from victims’ homes during raids. In BC, there is a report of Royal Canadian Mounted Police (RCMP) officers taking Robert Bateman paintings off the wall of a home they had raided. In New Brunswick, RCMP have seized microwaves from homes and called movers to take out all the household furniture. As the economy worsens, seizures allow police, politicians and their government agencies to continue enriching themselves and increase their budgets, firepower and manpower. Read the whole piece. You can read part one here. Swiss voters have backed a change in health policy that would provide prescription heroin to addicts. Final results from the national referendum showed 68% of voters supported the plan. The policy is described as one of last resort - prescribing addicts with the very drug that caused their problems in the first place - but supporters say it works, and Swiss voters appear to have agreed, the BBC's Imogen Foulkes in Berne says. At the same time, Swiss voters rejected a plan to decriminalize marijuana. Recent studies suggesting that long-term use of the drug may be more harmful than previously thought looked likely to encourage a "No" to decriminalisation. Early results showed only 36.8% of those voting supported decriminalising cannabis, the Associated Press (AP) news agency said. If only marijuana was as addictive as heroin! Conrad Black thinks war on drugs is money "squandered"
Western Standard publisher Matthew Johnston posted about Conrad Black's surprisingly radical piece in the Times Online earlier today. There's almost a temptation to conclude that Black's become something of a libertarian while going through his ordeal. You might call it the libertarian "scared-straight" program -- for the thoughtful, prison might be the ultimate conversion tool. The US is now a carceral state that imprisons eight to 12 times more people (2.5m) per capita than the UK, Canada, Australia, France, Germany or Japan. US justice has become a command economy based on the avarice of private prison companies, a gigantic prison service industry and politically influential correctional officers’ unions that agitate for an unlimited increase in the number of prosecutions and the length of sentences. The entire “war on drugs”, by contrast, is a classic illustration of supply-side economics: a trillion taxpayers’ dollars squandered and 1m small fry imprisoned at a cost of $50 billion a year; as supply of and demand for illegal drugs have increased, prices have fallen and product quality has improved. Unless I'm misinterpreting him, it looks to me like Black thinks money spent on the war on drugs is money "squandered." That in spite of blowing through ridiculous sums of money, there is just about nothing to show for it. Conrad Black understands what Milton Friedman said so long ago: "The war on drugs is a failure because it is a socialist enterprise." It always amazes me that there are still so-called conservatives who manage to somehow reconcile opposition to social engineering and big government, with the ultimate social engineering and big government program: the war on drugs (of course, the more subtle, intelligent, and thoughtful conservatives have long ago abandoned the war as anything other than an out-and-out socialist program) . Separately, it's worth mentioning Pierre Lemieux's "three witches" column from the Western Standard in this connection. Published on Feb. 13, 2006, Lemieux compares Bruce Montague, Marc Emery, and Conrad Black. He dubs them the "three witches" that the state is determined to burn. Yet there are crucial similarities. The three men are attacked for crimes that did not exist a few decades or even a few years ago, before the state defined them as crimes. All three defended some aspects of our traditional liberties: Bruce Montague has fought the wicked gun controls directed against peaceful citizens; Marc Emery has campaigned for the right of adults to consume what they want; and Conrad Black, despite his association with liberticidal establishment figures, has given a voice to libertarians in the newspapers he bought or created. The state is going after these men with its full force and enormous resources. They are all liable to spend several years in jail--decades in jail for the two who are prosecuted by the U.S. government. Their travel is restricted by court order; two of the men (Montague and Emery) even had to hand in their passports. Black and Montague have had property seized or frozen before judgment. Black and Montague have been explicitly forbidden to have guns (as was Emery, but under a previous minor conviction), probably because guns are the ultimate symbol of the free man. Associates or friends of Black and Emery, and Montague's wife, have also been prosecuted. This is the state in all its glory. Vote away (if you want to post this poll on your own blog or website, here's the link for that). If you want the back story, here's our take. If you want to read Emery's latest piece exclusive to the Western Standard, you can read it here. As for our "official" position: The Western Standard strongly opposes the extradition of libertarian publisher and Western Standard columnist, Marc Emery. Here's a pretty good documentary about marijuana prohibition entitled "The Union: The business behind getting high." Since we've posted plenty of columns by Marc Emery recently, and since many of our commenters are hostile to rethinking the war on marijuana, a documentary explaining some of the arguments in favour of marijuana legalization (not decriminalization) is just the thing to keep the discussion going. Here's part one. Parts two through 11 are below the fold. The documentary is fairly comprehensive, and it is pleasant to watch. I'd be curious to read feedback and responses to the documentary in the comments. UPDATE: Go below the fold for the video. It's too wide, and I don't know how to make it more narrow. We're big fans of professor John Frary, the Republican challenger in the second district of Maine. We've posted an overview of his campaign here, his campaign videos here, and even conducted an interview with him, where we discovered that he was already familiar with the Western Standard. He said he checks us out "quite regularly" and that we give him "much satisfaction." We're happy to say that his campaign is one we've been following, and it's given us much satisfaction as well. In no small part, it's because Frary shares some gut-level pro-liberty positions with us at the WS. So we've decided to publish Frary's opinion piece wherein he says Mainers, and the rest of us, need to reconsider the war on drugs. The economics of the drug trade are clear. Demand remains undiminished. The cost of production remains low. Arrest a horde of producers, smugglers, wholesalers and retailers and all that can happen is that the profit margins go up. That is what must take place when supply diminishes while demand remains steady. Higher profits brings more recruits into the trade. More: When the flow of one drug is reduced, alternative drugs seem always to spring up to take its place. I suppose you could round up the millions of users and execute them, but I think the public might be a little hesitant to resort to such extreme measures. I know I am. I'm in some very good company with prominent conservatives in questioning this policy -- Milton Friedman and William F. Buckley, to name just two. And this year the drug enforcement people are upset because they are finding fewer plants in northern Maine. It seems that the number of helicopters available to search is down, because they have been transferred to Afghanistan." Personally, I prefer pursuing Osama Bin Laden to pursuing some Maine organic farmer. Who owns you, Michael Coren? I listened to part of the show today on 1010 CFRB Toronto called Two Bald Guys With Strong Opinions. Today's show was two guys arguing for and against CCTV cameras on public property. It was my first time listening in, and I was driving so I couldn't call in and the phone number was not mentioned. I don't know whether the hosts just pick a side for the sake of the show, or whether Michael Coren was really taking the point of view of the surveillance statist. I'm going to assume he means it. He put one caller on the spot (who brought up the Patriot Act) by insisting he name one government program that government had actually taken advantage of. The guy choked up, maybe a little nervous. But Michael had, in the previous three minutes, brought up human rights abuses by the HRCs (freedom of speech and expression, after all, is a human right). In light of this, why doesn't Michael name us one government program that hasn't failed or been abused by government in some way? It was surprising and sad when Michael characterized libertarians as people who don't fully believe in the rule of law. In reality, all libertarians know that freedom is impossible without the rule of law protecting the rights of individuals. Maybe Michael just doesn't know enough about libertarian political philosophy. Here you go, Michael, why not learn about it from an easy-to-read and easy-to-understand source: Wikipedia. Or an even shorter version from Cato's David Boaz here. Coren is in favour of the use of CCTV cameras. He's even in favour of using them to catch people for consensual crimes -- he said they should be used to catch drug dealers. In practice, that means users too. His argument is essentially an argument for a surveillance society that will help prop up the failed war on drugs. I hear they now have loudspeakers on some of these cameras in the UK so that bureaucrats can bark orders at people if they throw a candy wrapper on the ground. These cameras have been abused already to spy on people inside their own homes. Take a look at this, Michael. How many of these cases go unreported? The thing that Michael needs to know is that in Canada we love our civil liberties and we don't want one camera per 14 people like in the UK. But adopting other countries' bad ideas is something governments do best. So maybe ours will adopt CCTV cameras with Michael's endorsement. I heard a guy call in and say "if you're not doing anything wrong, you have nothing to hide." Michael did not disagree. I heard that line from a Mountie who wanted to search my car. He said if I don't allow him to search my car, then that means I have something to hide. It was because of this illogic that I refused the search. The mounties don't have a right to search my car unless they suspect that there's something illegal going on. And refusing a search is not a reason to think that something illegal is going on. It's reason to think that I don't want some stranger looking through my stuff. It's also reason to think that I like freedom from tyranny. I heard this same newspeak from Michael. He said that CCTV cameras on government property liberate us. That is like saying war is peace, freedom is slavery, ignorance is strength. This is the London, England that Michael Coren wants for Winnipeg, Calgary, Toronto and so on. So Michael Coren, who owns you?